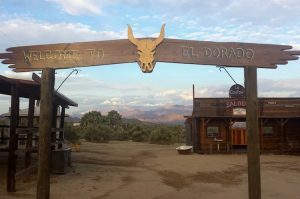 The town of “El Dorado” in the backyard of the Ranch House. Enjoy the Beauty and Solitude of the High Desert! The neighborhood features incredible 360-degree views of the desert and mountains. You will have ultimate privacy and tranquility no matter which secluded property you choose — breathtaking sunrises, magical sunsets, nearby hiking trails, and the multitude of stars at night will leave lasting impressions of your stay with us. Outdoor wedding set-up at the Rock House. We offer 7 inviting Joshua Tree National Park lodging properties (Studio-3BR), each decorated with rustic flair, that allow families, friends, and couples to have a great time as they escape the city for a special desert experience. Each house is nestled on its own serene acreage (2.5 to 22.5 acres) with a full kitchen and comes fully equipped for indoor as well as outdoor entertaining. If you would like to rent more than one property for a family gathering or other group event, all of our properties are conveniently located only a few minutes apart by car. We Reduce, Reuse, & Recycle! Each of our homesteader cabins has been artistically recreated, by owner Lori Portillo, with individual style and personality. Properties have many creative touches inside and out! While each house has a different feel, most feature eclectic vintage and DIY furnishings, custom tile work, fire pits made from reclaimed bottles, and more. For those concerned about the environment, we enthusiastically embrace a “reduce, reuse, and recycle” ethic when building and furnishing our cabins. We are committed to working greener to not only cut down on waste headed to the landfill, but to also create uniquely charming spaces for adventurous, creative, and environmentally-minded travelers. 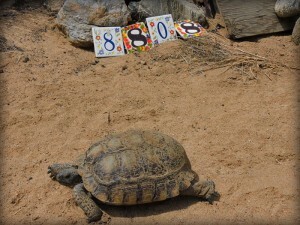 This desert tortoise makes occasional appearances in the neighborhood. If you are looking to commune with nature, all you need to do is walk out your door to take a hike on nearby trails, explore an abandoned homesteader cabin down the lane, and photograph the local flora and fauna. The area is rich with wildlife. You may see cottontail rabbits, jackrabbits, birds of prey, roadrunners, cactus wrens, lizards, desert tortoises, coyotes, and more. Our location is one of the absolutely best in the area! 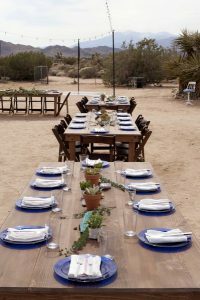 If you are looking to have dinner out or to do some shopping, our cabins are only 10 to 15 minutes from the village of Joshua Tree, 20 minutes from Pappy & Harriet’s in Pioneertown, and 45 minutes from Palm Springs. Check out our suggestions for the best local spots here. The weather is generally 10 to 15 degrees cooler than Palm Springs all year long!